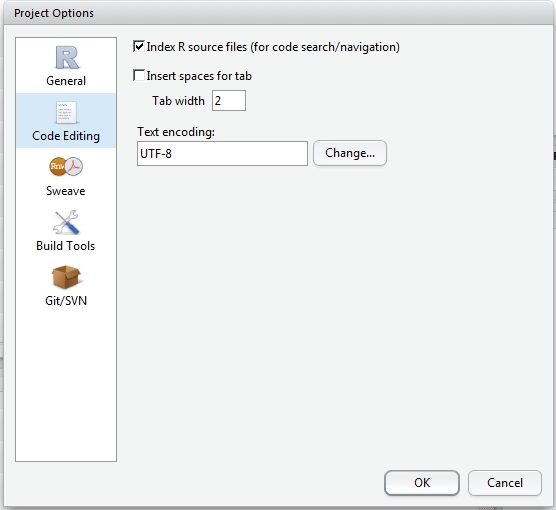 Rstudio and makefiles: Mind your options! I have written this post mostly for myself. I don’t want to waste 2 hours on this problem again at some point in the future. Hopefully others might stumble on it too and save some aggravation. So, the issue I had this morning was writing up a a makefile in RStudio. I am new to make and makefiles, but have been able to get them running successfully in the past; however, the makefiles I’ve used were mostly borrowed from others and only minor edits were made. This morning I was trying to add a new target and some dependencies. As most of my work these days is with R, I prefer to do most of my writing and editing directly in RStudio. Thus, I fire up RStudio, penned some great prose in R Markdown, and then went to add a new target to a makefile that was to take my R Markdown file, and create an output .pdf and .docx. Seemed simple enough. Looks pretty good! Or so I thought. I sauntered on over to my terminal window, and confidently type make and, it runs the first target fine, and then stops… Next step for me was Google and I was rewarded with A Brief Intro to Makefiles. Ah ha! My problem is the tabs. I then head back to RStudio, dutifully replace what I thought were spaces with tabs, run make. Same problem. After making this change, I once again replace my spaces with tabs, try again, and still no good. 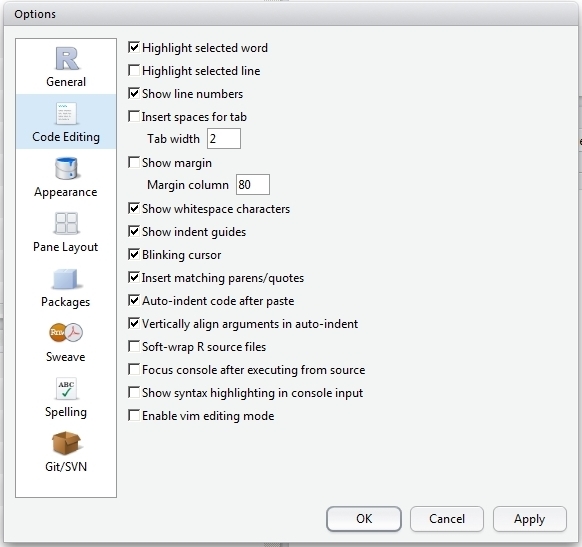 At this point I am sure I know the problem is related to the spaces, but for the life of me I can’t figure out why RStudio tabs are still getting input as spaces. I give up and copy/paste everything into notepad++, reset my tab options there and go about replacing the tabs. This time it works. At long last my tabs are tabs and my makefile makes and it can all be done in RStudio, provided I take care of my options. This entry was posted in Open Science, Programming, R, Things I Forget and tagged knitr, make, pandoc, R Markdown, tabs to spaces on February 14, 2014 by jeffwhollister.